This new software version makes the legendary AKAI MPC recording system available to anyone that uses any MIDI controllers such as those from M-Audio, Native Instruments, Alesis, Novation, etc. You no longer need to own any MPC hardware to use the amazing MPC software on Mac or PC. AKAI Professional announce MPC 2.2 software. 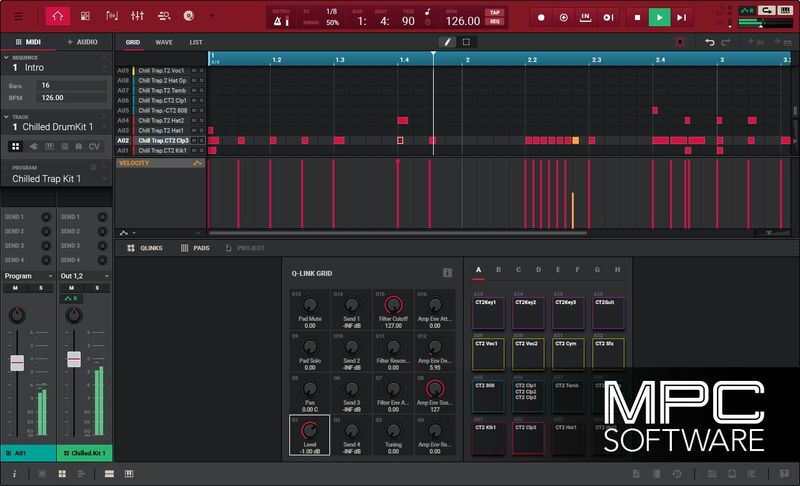 Whether you're seeking freedom from computer based music production, or searching for the perfect controller for DAW-centric creative exploration, MPC Software 2.2 grants the ultimate in adaptive creative versatility. Redefining the creative vista and driving MPC X and MPC Live in standalone and controller mode is Akai Professional's reimagined MPC Software 2.2; a cutting-edge production suite combining 128-track sequencing capability, real-time time stretching, clip-launch functionality, advanced MIDI editing capability, VST compatibility in controller mode, operation as a standalone application on Mac & PC, advanced sampling & audio editing/recording functionality, seamless DAW integration, a redesigned GUI and much more. The new 2.2 update introduces a number of powerful production and performance features, including: Global MIDI Learn functionality - MPC's desktop software can now be controlled by any external MIDI control surface including keyboards & pad controllers; Project MIDI Learn functionality – now MPC standalone and desktop software's automatable parameters can be controlled by external MIDI control surfaces such as keyboards, pad controllers & MIDI mixers; Humanising functionality allowing users to randomize the timing or velocity of MIDI events for a truly natural, organic production experience; and, Random Event Generation, that when activated adds random melodic patterns and drum beats – the ultimate experimental and inspiring solution to spark new ideas or take productions to never before chartered heights. Latest version of the acclaimed composition software features audio track recording, real-time audio warping, Audio and MIDI drag-and-drop, along with enhanced Q-Link control. As musical styles evolve and new genres emerge, we stay on top of the current movements in sound to ensure your MPC is always stocked with the freshest new samples. Check here as we constantly release high quality, subgenre focused Expansion Packs for your MPC.